Our coaching pathway allows coaches to plot their own learner journey through a range of qualifications and workshops, helping them to fulfil their coaching potential. So, for more information on these, please explore the courses section of the website. 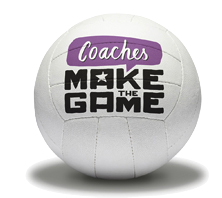 These pages are designed to promote coaching opportunities within our clubs, schools and communities. Birmingham City Uni looking for an Assistant Coach! Birmingham City University have 4 competitive BUCS squads and a development team with lots of potential and are currently seeking an assistant netball coach to assist their Head coach to start in September. Training is Mondays (5-7pm) and Tuesdays (6-8pm) evenings at Doug Ellis Sports Centre, BCU, B42 2SY. £20-£30 an hour will be paid dependent on experience. A minimum of level 1 coaching is required and Level 2 is preferred. Stockland Belles looking for a Coach! Stockland Belles (Currently Division 12 in Birmingham Winter League) are looking for a coach. They currently train Tuesday evenings at Stockland Green 7pm to 8pm. If you are able to help, even if every other week, rather than weekly, please email Sarah on sarah.barber@virginmedia.co.uk asap.